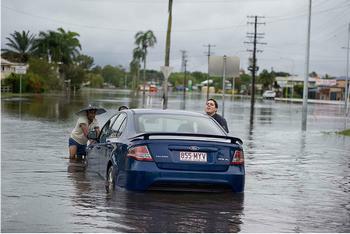 BRISBANE, Queensland, Australia, January 3, 2011 (ENS) – More than 200,000 Australians have been affected by floods in Queensland that began on Christmas Day with the arrival of Tropical Storm Tasha. One person is dead and another is missing as high waters washed out roads, isolated towns, and forced thousands to evacuate. More than 1,600 homes have been evacuated and many thousands of businesses have been affected. Evacuated residents have been warned they may not be able to return to their homes for weeks. Most major highways across the state are still closed by the highest floodwaters in 50 years. The coastal city of Rockhampton braced for major flooding on New Year’s Day and is still waiting for the rising waters to peak. State Disaster Coordinator Deputy Commissioner Ian Stewart said, “The city of Rockhampton has already experienced significant flooding with the current river level at nine meters (29 feet) and still rising. 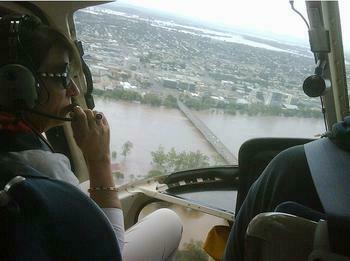 Queensland Premier Anna Bligh flies over the flooded coastal city of Rockhampton. The Fitzroy River at Rockhampton is expected to peak up to 9.4 meters on Wednesday and remain above the major flood level of 8.5 meters for a week after the peak, according to the Australian Government Bureau of Meteorology. Road access to the city from the west and south, along with rail and air access, has been cut. Resupply of Rockhampton with 50 tonnes of food supplies took place today because the Bruce Highway north of the city could be closed within the next 24 hours should the Fitzroy River reach 9.4 meters. “The Australian Defence Force will be flying critical supplies to Mackay today and these will be trucked down to Rockhampton, until the road becomes impassable,” Stewart said. In that case, food will be sent to Rockhampton either by barge or by helicopter by the Australian Defence Force. Prime Minister Julia Gillard visited some of the flood affected areas on Friday. In a news conference today, she said central government funds will be available to flood-affected families and businesses. Gillard announced Friday that an Australian Government Disaster Relief Payment amounting to A$1,000 per adult and $400 per family would be provided immediately for emergency assistance. In addition, said the prime minister, families and individuals can be eligible for assistance for repairs to their homes and dwellings, that assistance is of up to $10,250 for individuals and $13,800 for families. Further, Gillard and Queensland Premier Anna Bligh are offering grants of up to $25,000 for small businesses and primary producers for cleaning up and recovering and concessional loans of up to $250,000 for businesses and farms. While floodwaters are receding in some towns, the floods are not over yet, Stewart warned. “With 200,000 Queenslanders affected to some degree by the unprecedented flooding, and more towns and communities on alert, we need to remain vigilant to the risks still posed to Queensland families, businesses and rural properties,” he said. “For those awaiting the flood waters to impact their communities please stay informed and ensure you have plans in place for evacuation should it become necessary. Do not risk your life, property can be replaced, people cannot,” said Stewart. Flood waters now are receding from many areas of the state and home and business owners are surveying the damage left behind, while the people of Rockhampton, St. George and Surat monitor rising river levels and encroaching flood waters. Additional resources, including police, State Emergency Service and Queensland Ambulance Service personnel, are being deployed to the towns of St. George and Surat to help with flood preparations. “Visiting both St. George, which has a population of 2500 and Surat, with a population of 450, speaking to emergency services personnel and locals alike, I am confident that the communities are doing everything possible to prepare for the flood waters expected to reach their towns within the next 24 to 48 hours,” Stewart said. EMQ Acting Assistant Director-General Warren Bridson said discussions are underway with SES counterparts in New South Wales, Victoria and South Australia for support as the response and recovery efforts continue. “This will be a protracted response and recovery. While some towns’ river systems are still rising, others are moving into recovery mode and looking to re-establish their homes and businesses,” Bridson said. “Our SES volunteers across Queensland are a resolute and strong collection of people but some may have to return to workplaces and others have been helping disaster communities for weeks and may be tiring. Interstate assistance will bolster Queensland’s SES volunteers to ensure that the communities continue to receive support in coming weeks and months,” she said.